Joe Lauzon is a UFC lightweight with a record of 23 wins and nine losses. He is tied with Anderson Silva for the most post-fight bonuses in the UFC at 12. He was one half of 2012’s UFC Match of the Year, a bloody three-round battle he lost to Jim Miller by unanimous decision. He is also an artist’s muse. 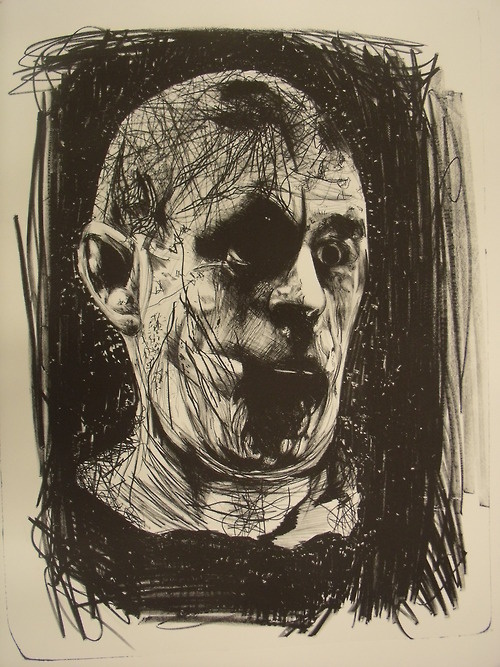 Inspired by Lauzon’s intensity and love of fighting, Irish artist, filmmaker, musician, and writer David Balfe created a series of stone lithography prints of the fighter during a recent residency in Bergen, Norway. The six prints that Balfe has released from that series, all of which come from the Miller fight, are striking, if you’ll pardon the pun. 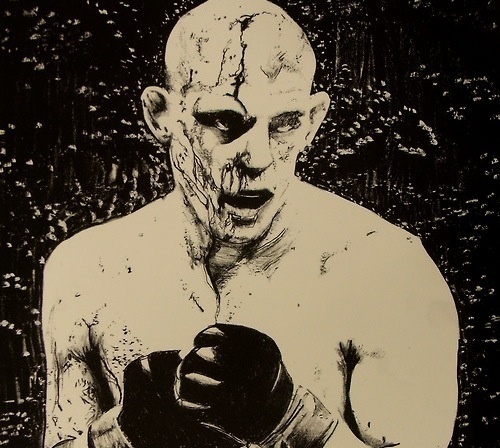 They capture both the intensity of Lauzon’s focus and the extent of the crimson mask that poured down his face over the course of that match and, in the process, hint at the all the dedication and drama--and, yes, the violence--that make MMA such a captivating sport. Intrigued by the portraits, I contacted Balfe. The 22-year-old answered my questions via e-mail during a rare break from working on his thesis. Fightland: When and how did you first discover MMA? Was the artistic appeal of the sport immediately evident to you? Or were you more of a general fan at first? David Balfe: When I was six, my Ma told me that if I was to get into one more fight, we would move house. It was an empty threat made out of love, but I feel that propensity for fighting as a child was what finally encouraged my Ma to allow me to join the local Kenpo Karate club. I’ve been studying there … since. Although I grew up learning that traditional Kenpo system, I was also learning to fight from my coaches using this hybrid of styles they had worked and reworked over the years. What I am suggesting here is that I was familiar with this idea of a mixed martial arts long before I was exposed to MMA as an entity unto itself. My introduction to MMA came from watching the UFC and PRIDE and as the years passed the same attention was granted to the likes of Bodog Fight and DREAM. Sometime around 2005 I met Paul Curran, who is now one of Ireland’s most revered spoken word poets. Paul was the first person I met outside of combat sports that was interested in MMA and speaking to a man so obsessed with speech and expression about this sport I loved allowed me to finally intellectualize MMA and develop the “artistic” view I have now. 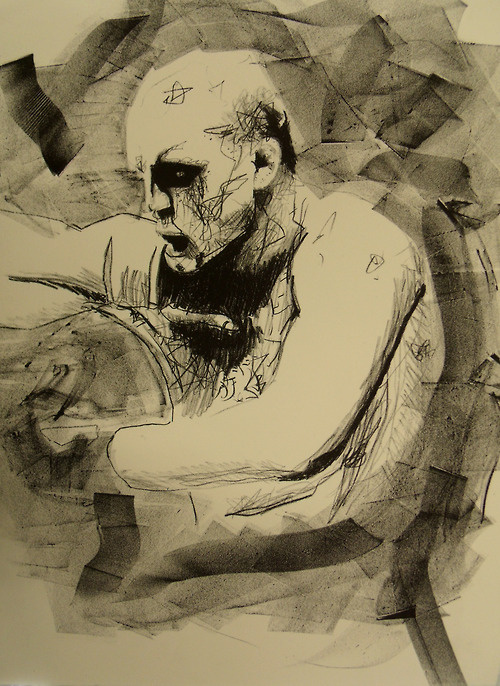 What is it about MMA and combat sports that inspires you as an artist? About four years ago, I had an accident in Belgium resulting in a terrible break in my lower leg and had a plate and six screws fit. One year later I was back in the club for my first night of sparring since. We had potentially the best kickboxer I’ve ever trained with joining us for sparring and I started with a round with him. I was so caught up in the joy of the return that I forgot to employ even the most basic defense and found myself immediately out on my feet, but I did everything I could to survive until the end of the round. Instead of feeling deflated or depressed at my visible failings, I was more joyous and on a completely new plane. I had reached an extremity and elevation that had been locked away for a year. It is the search for that extremity in my creative pursuits that have been totally influenced by my experience with combat sports. My obsession with narrative and story (that are probably obvious here through my anecdotal explanations) are completely satisfied by watching MMA. The collective scarring and punishment a fighter receives is built up the same way my drawings and depictions are. The application and reapplication of differing marks and attacks to one spot breeds narrative; for me, this is as true with MMA as it is with drawing. Abuse over abuse. Action over action. To change a situation with the constant connection of one surface to another is what I often seek to do in drawing. What is it about Joe Lauzon in particular that made you want to do a series on him? I have been watching Joe evolve as a fighter for years, but what has grabbed me since the first time I watched him enter the cage is the tenacity he brings regardless of expected outcome or opponent. Joe Lauzon seems to purely be motived to fight by fighting itself. Not success, not fame or even victory, but simply by the beauty of fighting. Perhaps I’m wrong, but I have always read it this way and that in itself, to me, carries a weight and significance few others hold. Observing that motivation helps me connect with a trait present in people that I want to depict. When I watch Joe fight, I watch Joe fight out of love. The love of the fight, but still love. It is void of ego, and having the opportunity to attempt to depict that is ever-giving. I didn’t make those prints for anybody else other than myself, but there is great warmth in seeing the reaction they have received. I made those prints to try and further understand that quality and perhaps that speaks to others too. There is no doubt an aesthetic beauty to the fight that makes it a joy to attempt to express, but there’s an element of beauty that moves past the aesthetic that I’ve yet to be able to explain or touch on outside the confines of those prints. I’ve shown that fight to a lot of people and most, if not all, have shared that element, even when they’ve been disgusted by the imagery. It is a sacred thing. The inability to find whatever collection of words to accurately express that has been one of the primary motivators in my desire to make the series. This was the only opportunity I had to attempt to deconstruct and fruitfully understand it. Before I saw your art, I’d really only found art in the moves and strategy of MMA. I found beauty in a well-executed gogoplata or a perfectly-timed jab, but I’d never really considered that there could be art in the aftermath of those things. 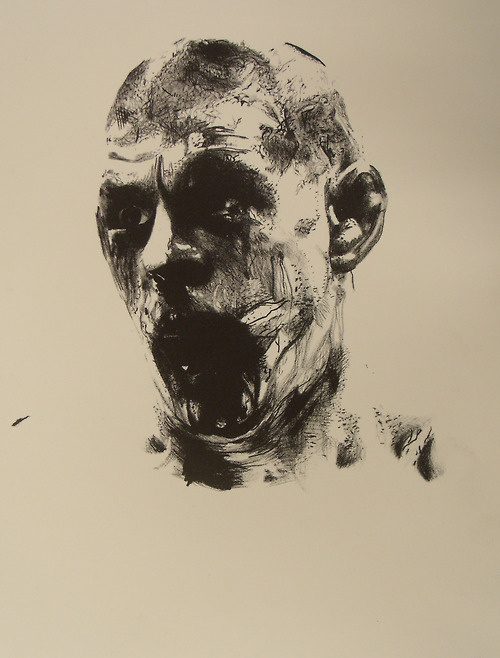 There is something really arresting about something like Lauzon’s blood-spattered face, though. It looks almost like an abstract painting. Is that something you were hoping to convey with this work? For me, having that aesthetic to depict is just a benefit. It is not what I wanted to show but surely makes the images more visibly arresting. Having an alternative view of the human face can be nothing other than significant and there is no way to deny that we had that with the accumulation of damage to Joe’s face. There are no doubt aesthetic links to be made to abstract painting, but for me there is not just an aesthetic crossover but also a theoretical crossover between a fight like that and the work of the Viennese Actionists or Chris Burden. I cannot expect everybody to make any links between art and MMA, but the connection for me is just the result of my 22 years. What about other art forms? Have combat sports influenced your work in video or music at all? Do you think they will in the future? My personal experience with combat sports will influence every aspect of my output. Every creative pursuit is driven by the desire to reach the same extremities and elevations I have found in the beauties of the fight. As for watching MMA, I can’t truly say. There will most likely always be something I want to understand, something I want to capture, and I will have to express that in whatever language makes the most sense to me, so the reality is there is no way to tell and no limits to place on it. I made a piece of film about the last time I was attacked with a knife on these North Dublin streets. That piece is one of the most important I have ever made. It was driven by the experience, but it was informed by my life with combat sports. That will never change.